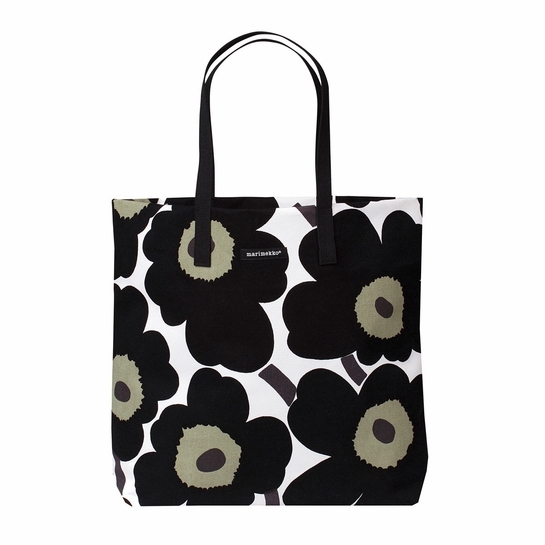 More about Marimekko Unikko Black Silja Shopper Bag Be smart and stylish while running errands by having the Marimekko Unikko Black Silja Shopper Bag in hand or on your shoulder. The 100% cotton canvas bag is an eco-friendly alternative to a bouquet of plastic bags, and the roomy interior will fit products and produce-a-plenty. There is also a convenient zipper interior pocket to keep important loose items like keys and your phone safely within reach. Is 18" L mean from the bottom of the bag to the top of the handles? The dimensions represent the bag itself - it does not include the handle.